Tennessee is crazy for football. But for one week in October 2018, the Tennessee Titans will have to give way to Saturn’s moon Titan. 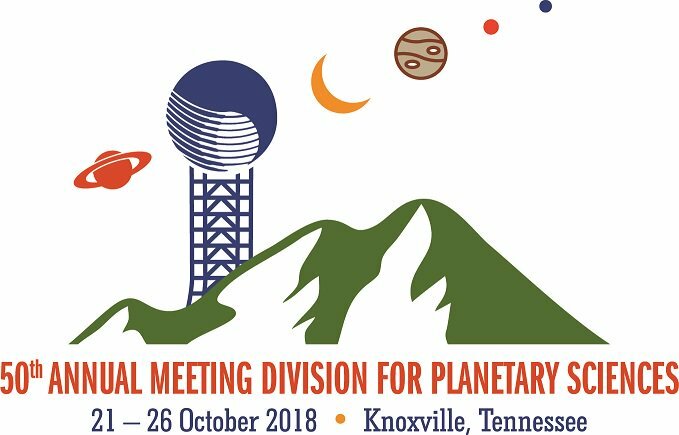 The 50th annual meeting of the AAS Division for Planetary Sciences (DPS) takes place at Tennessee's Knoxville Convention Center, 701 Henley St., Knoxville, TN 37902, from Sunday, 21 October, through Friday, 26 October 2018. About 800 researchers from the United States and around the world are expected to attend to discuss new findings about our own solar system as well as planetary systems around other stars. Highlights will include new data from ground- and space-based telescopes as well as from robotic interplanetary missions. Meeting hashtag: #dps18; you may also wish to follow @DPSMeeting, @AAS_Office, and @AAS_Press on Twitter. In addition to daily oral and poster sessions, the 2018 DPS meeting features more than a dozen plenary talks by distinguished planetary scientists: Fran Bagenal (University of Colorado, Boulder), Carolyn Brinkworth (National Center for Atmospheric Research), Clark Chapman (Southwest Research Institute), Anita Cochran (University of Texas, Austin), Dale Cruikshank (NASA Ames Research Center), Courtney Dressing (University of California, Berkeley), Jennifer L. Eigenbrode (NASA Goddard Space Flight Center), André Izidoro (São Paulo State University), Thomas Kruijer (Lawrence Livermore National Laboratory), Hikaru Yabuta (Hiroshima University), Thomas McCord (Bear Fight Institute), David Morrison (NASA Ames Research Center), and Carle Pieters (Brown University). Two 2018 DPS award winners will give prize talks: Francesca DeMeo (MIT), recipient of the Harold C. Urey Prize for her work on asteroids and asteroid classification; and Julio Fernandez (Universidad de la República, Montevideo, Uruguay), recipient of the Gerard P. Kuiper Prize for his work on comets and the origin of the solar system. Bonnie Buratti (Jet Propulsion Laboratory), winner of the Carl Sagan Medal for outstanding public communication by an active planetary scientist, will give a public talk to which the citizens of Knoxville will be invited. Faith Vilas (National Science Foundation) will receive the Harold Masursky Award for meritorious service, and Alexandra Witze will receive the Jonathan Eberhart Planetary Sciences Journalism Award for her article about NASA’s plans for Mars sample return in Nature. Throughout the week, DPS 50 will feature a wide selection of topical and professional-development workshops, including “Future Pluto and Kuiper Belt Missions: The View from 2018,” “Near-Earth Objects: Survey and Follow-Up Operations,” “Proposal Writing: Using NASA Roses as a Template for Success,” and a workshop on mentoring. There will be Town Halls on Arecibo Observatory and the James Webb Space Telescope, an sbpy Workshop and Python Hackathon, a Women in Planetary Science Discussion Hour, and numerous other opportunities to meet with fellow attendees to explore topics of mutual interest. The annual DPS banquet will be held at the Knoxville Museum of Art, followed by Open Mic Night, a showcase of DPS members’ impressive talents in the arts and entertainment. And after the meeting concludes, on Saturday, 27 October, attendees will have two options for field trips: a visit to the Smoky Mountains to examine the geology of the Appalachians, or an expedition to Blue Spring Cave, the longest in Tennessee and the 10th-longest in the United States. Visit the Registration page to secure your place at the meeting, sign up for workshops, reserve a seat at the banquet, and join one of the field trips. The regular registration deadline is 31 August; you can still register in advance from 1 to 28 September, but you’ll have to pay a late fee. If you haven’t registered by 29 September, you’ll have to wait to register on-site in Knoxville. To book a hotel room at the DPS group rate deadline: 27 September, visit the Travel & Lodging page. We look forward to Tennesseeing you in Knoxville!